Shattered Souls isn't just a book that you read, it's a book that you experience. I'm going to start out with that. Honestly, from page one I was completely hooked into Lenzi's struggle, her world, and everything going on. This is a haunting tale, with so much suspense that it sinks it's teeth into you and carries you along as things develop. What I'm saying is that this is a book that you need to read. It's addictive. We meet Lenzi, a troubled girl who isn't quite sure what is going on in her life. She keeps hearing voices, seeing visions, and the pills just aren't working. However Lenzi isn't the type to back down. I loved that her character was so deep and realistic. No matter how much fear she feels, she is willing to admit it and move forward anyway. It helps, of course, that she has Zak, her sweet and broken boyfriend, to keep her grounded. I fell in love with him almost instantly, despite his cracked interior. The two of them are really sweet together, until cocky and charming Alden comes along. In fact, the more time Lenzi spends around Alden the tougher things get. Do you sense a love triangle? If you do, you are correct. I'm generally not a huge fan of them but honestly? This one is done perfectly and it's delicious (and addictive) to read! This is a book that will really keep you on your toes as you read. All the emotions in this book are palpable, and I found it so easy to feel what Lenzi was feeling. The emotional aspect of the writing in this book is done so gorgeously, that it just bleeds off the page and into your heart. Although the basic plot of Shattered Souls is rather simple, Mary Lindsey adds in her own twists that will keep you reading well into the night. There are so many beautifully executed clues peppered into the story. By the time I was halfway through I was completely enamored and engaged with the book. There is something for everyone in here. Wit, twists, anger, a slight creep factor. It's all here. What killed me (and I loved) at the same time, was the ending. I won't spoil it one bit. This is a story you'll need to experience for yourself. I will say that the climax to this book leaves nothing wanting. Except perhaps that you'll want another book. 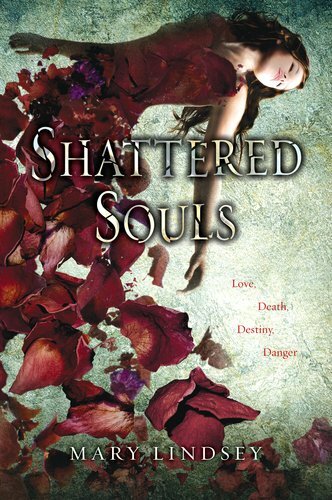 A wonderfully written debut, Shattered Souls is a book that I would (and will once I get my own copy) read a hundred times over.